Cathead’s Diner serves Southern-style comfort food for any collar, featuring big biscuits and even bigger characters. Find us in Little Rock’s East Village for breakfast, brunch, lunch and dessert, plus Cathead’s catering and bakery. In a hurry? We also offer a grab-and-go hot plates and baked goods. Can’t make it during the day? We’ve got dinner on Saturday nights with a family-style menu you’re sure to love! Get ready for a love letter to the South. Cathead’s Diner is all about the flavors, fixin’s, sweets and stories that get passed around a well-worn table. 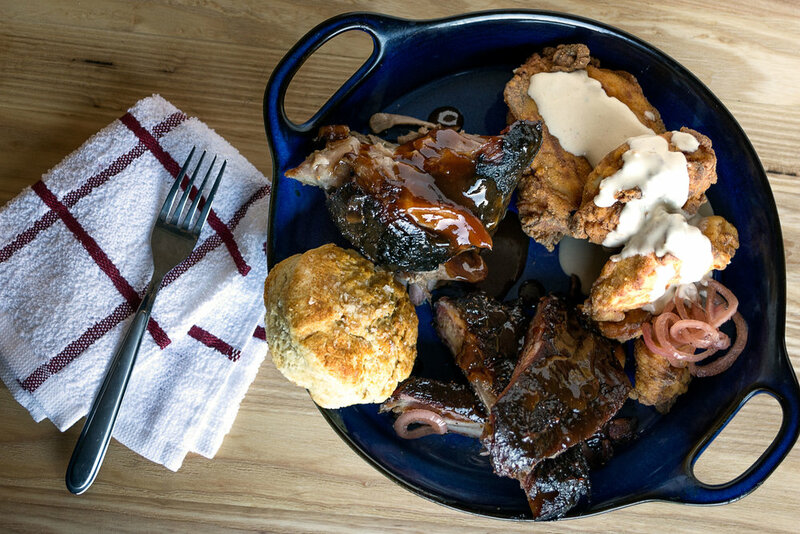 Nationally acclaimed Chef Donnie Ferneau created a menu chock-full of smoked meats and other savory specialties, many of them served on our namesake, extra-big biscuits. The sides are just as special, and dessert steals the show featuring scratch-made, pies and cakes, and Little Rock’s first gourmet donuts! You’ll find Cathead’s comfortably settled in the Paint Factory, a mixed-used development in Little Rock’s East Village. Delicious cold, not that there's ever any left over. Deep dark cake with rich fudge frosting. I'll have a little dessert with my dessert. a side of cheesy grits is always a good idea. meat lovers donut? Turtle donut? Cereal milk? Yes. heavy on the gravy, please. serves one, or two if you're generous. With a touch of lemon and rosemary, rich in flavor and juiciness. Check out that smoke ring. We offer unique, personalized catering for any event. From a quick fill ‘er up box lunch for twenty to two hundred, or a formal seated wedding dinner including the cake, we serve it all and every bit is made from scratch in our chef-driven kitchen. Our Cathead’s Catering Food Truck is also available for weddings, special occasions, private parties, casual lunches, and festivals. For more info, fill out the contact form below, and a member of our catering team will get back to you with details and availability. 515 Shall Ave in Little Rock, Arkansas’ East Village near Heifer Village. We are open Tuesday - Friday 7am - 2pm. Saturday & Sunday 10am - 2pm. We only offer dinner on Saturday nights from 5pm - 8pm. You can find up-to-date menus if you scroll-up on this page, or on our Facebook under the menu tab, HERE. DO YOU HAVE ANY VEGAN/GLUTEN-FREE OPTIONS? Chef Donnie's famous fried chicken strips & catfish are both gluten-free. We do not have any vegan options at this time, BUT both chefs are always trying new things, so continue to follow us on social media for menu additions and special features. Our all-you-can-eat champagne brunch is every Saturday & Sunday from 10am - 2pm for $25, which includes a mimosa or a frozen mimosa. If you don’t want alcohol, it’s only $22.50. Nope! First come, first served only. We DO take reservations for special dinner events. Please follow us on social media for details on when those take place. DO YOU HAVE GIFT CARDS AVAILABLE? Yes we do! You can get one for any amount, in person at the restaurant. WHEN CAN I ORDER OFF THE MENU? We only offer the breakfast menu on weekdays, Tuesday - Friday from 7am - 10:30am, and we have a dinner menu on Saturday from 5pm - 8pm. CAN I GET FOOD TO-GO? YES! On weekdays, you’re welcome to call ahead and pick up breakfast. You have to come in and go through the lunch line to build your to-go plate. We also have a cooler full of goodies for grab-n-go during any of our business hours as well. On weekends, since it’s all-you-can-eat, we don’t do to-go options, BUT if you wanna take home mini donuts, we DO offer them to-go at $1 each! WHAT ARE THE CHEF’S SPECIALS TODAY? 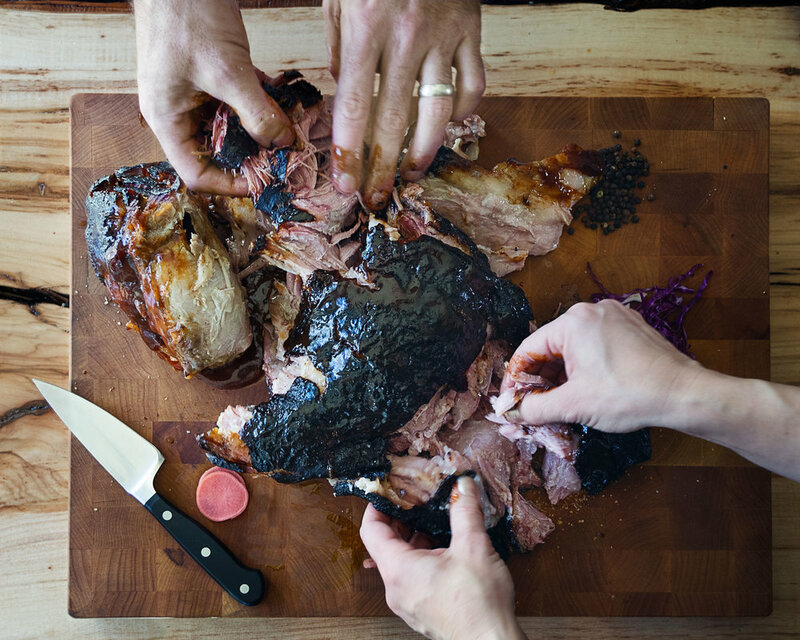 In addition to the day’s featured meat, fried chicken and house-smoked pork will be available as well. Chef Ferneau chooses sides daily, based on freshness and availability, so there is no set menu. On any given day you can expect an array of Southern favorites; like mashed potatoes & gravy, mac-n-cheese, green beans, baked beans, collard greens, braised cabbage, coleslaw, corn, peppered squash & zucchini, and many more! Feel free to call ahead and ask what’s available, but please try to call before lunch starts at 11am, cause once we get busy, it’s hard to answer the phone.